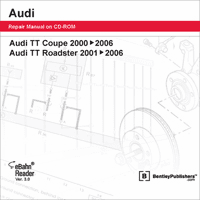 The Audi TT Coupe: 2000- 2006 Audi TT Roadster: 2001-2006 Repair Manual on DVD-ROM is the DVD-ROM publication of repair information for the Audi TT. This CD-ROM includes the eBahn Reader version 3.0, featuring Diagnostic Trouble Code (DTC) interpretive tools, a Vehicle Identification Number (VIN) decoder, as well as an enhanced user interface and support for technical content updates. This comprehensive repair manual contains the repair information provided to factory-trained technicians, making it an invaluable resource for the Audi TT owner. It provides clear & complete step-by-step procedures to help you understand, care for, and repair your 2000 through 2006 Audi TT. Wiring diagrams, component locations, and technical bulletins are also included in this manual.